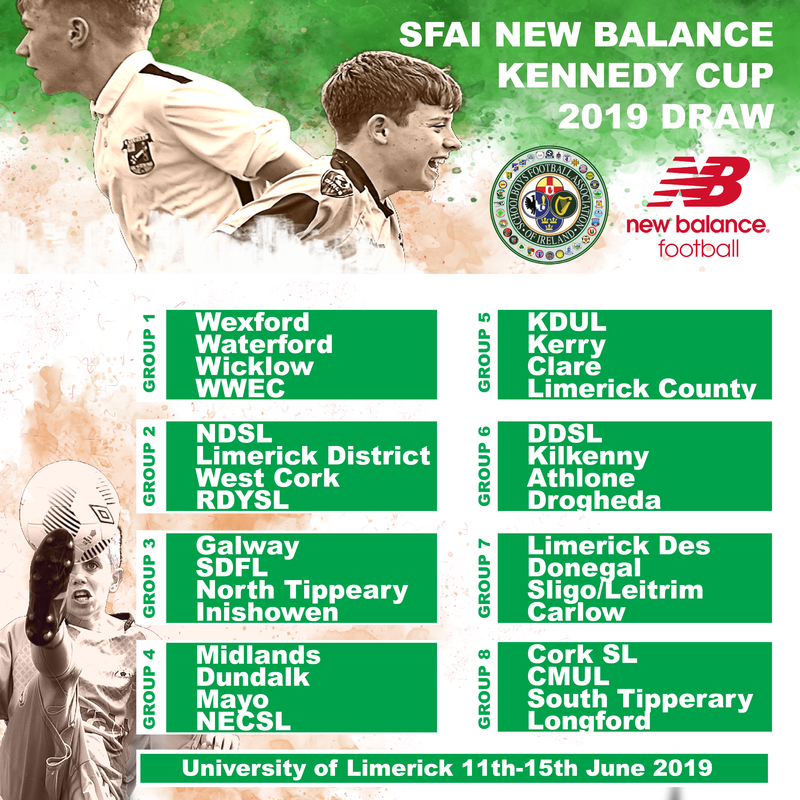 The Draw for the 2019 SFAI New Balance Kennedy Cup took place today (Saturday) in Ennis, Co. Clare. SFAI Chairman John Earley was joined by SFAI Vice-Chairman Pat Kelly and the Mayor of Ennis, Clare Colleran-Molloy, in the Auburn Lodge. The draw for the group stages saw some exciting groupings emerge, with Wexford, Waterford, Wicklow and the WWEC in Group One. Group Two sees the NDSL, Limerick District, West Cork and the RDYSL together, while Group Three involves Galway, SDFL, North Tipperary and Inishowen. The Midlands, Dundalk, Mayo and NECSL are in Group Four, while last year’s runners up, the KDUL are in Group Five with Kerry, Clare, Limerick County. The 2018 winners the DDSL are joined by Kilkenny, Athlone and Drogheda in Group Six, while Limerick Desmond, Donegal, Sligo/Leitrim and Carlow are in Group Seven. Finally, in Group Eight, Cork SL are joined by CMUL, South Tipperary and Longford. The full breakdown of the draw will be available on KennedyCup.ie in the coming days, and we wish all those leagues preparing for the competition the very best of luck. The action kicks off on June 11th in University of Limerick, with game beginning on the Tuesday and the Finals taking place on Saturday June 15th .